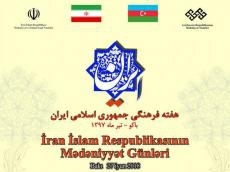 Days of Iranian Culture will be held in Baku on June 27 - July 1. The concerts with participation of Iranian figures of arts, exhibitions, screening films and theatrical performances are planned to be held as part of the event. Holding the Days of Culture promotes the development of mutual cultural cooperation between the two countries, the establishment of close communication and the expansion of the exchange of experience, Trend Life reported. In connection with the Days of Culture, a large delegation of cultural workers and art of Iran, headed by the Minister of Culture and Islamic Guidance, Sayyid Abbas Salehi, will arrive in Azerbaijan. Iran’s delegation comprising the well-known art and cultural figures will visit Azerbaijan to participate in the Days of Iranian Culture. An exhibition of handicrafts, photographs, paintings, samples of national clothes will take place in Baku Museum Center in Baku on June 27, at 17:00. The opening ceremony and concert of the Iranian National Orchestra at the State Academic Philharmonic will be held at 19:00. The film "Muhammad: Messenger of Allah" will be screened in Nizami Cinema Center on June 28, at 17:00. At 19:00, Titovak theater will stage "Divine Comedy, Hell" in the State Musical Theater. The concert of Iran's National Orchestra will be held in Ganja State Philharmonic on June 29, at 19:00. Azerbaijani and Iranian peoples have common cultural and religious traditions. Two countries successfully cooperate in many areas, including agriculture, transport, tourism, industry and other spheres. Baku hosted the Iranian Culture Days within the 4th Islamic Solidarity Games in 2017. The events were of big interest among Baku’s residents. Representatives of the country performed at a series of concerts, featuring country's national songs and dance numbers. The Days of Iranian and Azerbaijani cultures in 2010 and 2011 also kicked off with a great success.